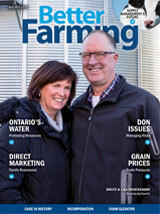 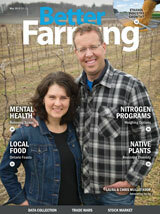 Better Farming April 2019 edition features Bruce & Lisa Cruickshank on the front cover and the following articles: Ontario's Water - Protecting Resources, Direct Marketing - Family Businesses, DON Issues - Managing Risks, Grain Prices - Trade Pressures, and Supply Management's Future. 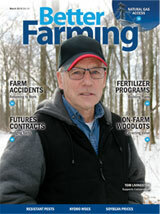 Better Farming March 2019 edition features Tom Livingston on the front cover and the following articles: Farm Accidents - Returning to Work, Futures Contracts - Hedging Tools, Fertilizer Programs - Building Programs, On-Farm Woodlots - Extracting Value, and Natural Gas Access.. 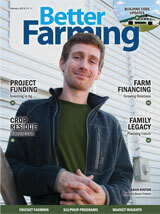 Better Farming February 2019 edition features Aran Hinton on the front cover and the following articles: Project Funding - Investing in Ag, Crop Residue - Managing Trash, Farm Financing - Growing Relations, Family Legacy - Planning Future, and Building Code Updates. 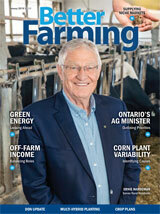 Better Farming January 2019 edition features Ernie Hardeman on the front cover and the following articles: Green Energy - Looking Ahead, Off-Farm Income - Balancing Roles, Ontario's Ag Minister - Outlining Priorities, Corn Plant Variability - Identifying Causes, and Supplying Niche Markets.